Starting plants from seeds provides an inexpensive option for adding plants to the garden. Whether you are growing flowers or vegetables, using recycled containers for seed-starting saves even more money. Readily available 2-liter bottles have an added benefit as a seed-starting container. The top of the bottle acts as a greenhouse, helping provide the right conditions for successful germination and early seedling growth. Re-use the prepared bottles each year or make new 2-liter seed pots from a fresh supply of bottles. Peel the label off the bottle. Rinse the bottle in hot water to remove any soda residue, then rinse the bottle in a sterilizing solution of one part bleach combined with nine parts water. Mark the bottle one-third of its length up the side. Cut the bottle in two at this point with a utility knife or pair of scissors. Poke two to three small holes in the bottom of the bottle with the point of the scissors. The holes provide drainage so the soil doesn't become waterlogged. Fill the bottom part of the bottle with moist potting soil. Leave a ½-inch space between the top of the soil and the edge of the bottle bottom. Sow the seeds in the soil. Plant them at a depth twice the seed's width and space the seeds 1 to 2 inches apart in the bottle. Slide the top of the bottle onto the bottom of the bottle. 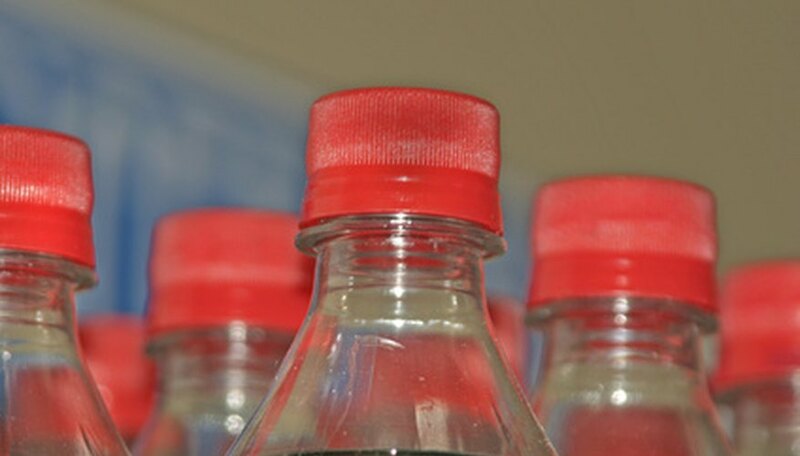 Cut a 1-inch slit in the side of the bottle bottom so it is easier to slide the top back on if necessary. Leave the lid in place at the top of the bottle. Place the bottle in a 65- to 75-degree Fahrenheit room to germinate. Most seeds do not require light to sprout, but locate the bottle in a brightly lit location that isn't in direct sun if light is indicated on the seed packet. Remove the lid from the bottle top once the seeds sprout and move the bottle to a sunny location. Remove the top of the bottle completely when the seedlings are large enough to touch the plastic. Use a smaller soda bottle for planting only one or two seeds at a time. Save the bottle tops and use them to protect plants from late frosts in the garden after you transplant the seedlings outdoors.